Soft contacts are the most popular lenses used today. 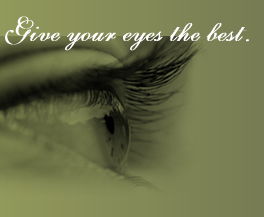 Disposable soft lenses are preferable due to their cleanliness, comfort and easy replacement. Hard contacts are also fitted in our office. Hard lenses give exceptionally good vision. They are also used for medically necessary corrections caused by diseases such as keratoconus. Our highly trained technicians will discuss with you all your frame and lens options for your new eyewear. They will take the necessary measurements to insure that your new lenses and frames provide you with the sharp comfortable vision that your eyes require for home or work. We have a very nice selection of designer frames, including our most popular sellers; Coach , Dolce & Gabbana, Calvin Klein and Esprit. For the active individual, we carry Flexon, Nike and Autoflex frames. For children, we offer creative and fun frames from Barbie, Disney, Converse and X-Games. We have an onsite finishing lab which can finish many eyglasses in less than one hour. * Should you decide to use your existing frames, we can order your new progressive or lined bifocal lenses and cut the new lenses into your favorite frame while you wait. This allows you to keep your current glasses for use, instead of waiting a week or more for your glasses to return from a contracted lab. * Call for verification of services, as some coatings and prescriptions may differ. Varilux Physio and the Varilux Physio 360 are the first general-purpose lenses to offer presbyopes (people who are near-sighted) the benefits of wavefront performance. By using wavefront technology these advanced lenses literally correct the distortions generated in the best of any progressive lenses. Benefits include more consistent distant vision, wider mid-range scope of vision, more comfortable vision at close distance, and better vision in low-lit settings. We have a very nice in-office selection of approved safety frames made by American Optical Safety. They are available in men’s and women’s styles of different sizes and colors. If extra protection is needed, side shields can be ordered for your safety frames. In some cases your employer may cover your costs for safety glasses.